China has announced new plans to control the use of coal to combat the dangerous levels of air pollution in its major cities. 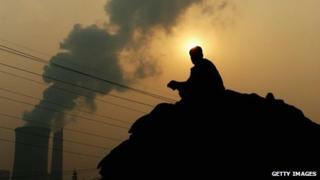 It will ban the construction of new coal-fired power plants in areas around Beijing, Shanghai and Guangzhou. The aim is to use more natural gas and nuclear power and to close down some of the worst offending factories . The State Council said pollution was harming people's health and affecting social harmony. A vast toxic cloud of pollutants settled over Beijing and large parts of north China last winter in one of the country's most prolonged environmental crises. The anger and alarm it caused appears to have concentrated the minds of top leaders, who have tended to focus more on the need for rapid growth than for clean air. The new initiative identifies the biggest offender as coal, which fires more than two-thirds of China's power plants. The targets being set could reduce that capacity by some 5% over the next four years and replace it with cleaner fuels. The number is considered ambitious because China's voracious demand for more power is still growing rapidly each year. The new measures are targeted at the country's largest cities, where smoggy skies and high pollution alerts are visible to a rising and more assertive middle class, and to the outside world. The plan calls for a reduction of about a quarter in the dangerous fine particles that blanket Beijing. Environmental groups have applauded the ambition of the targets. But some environmental groups have expressed doubts about how successfully they will be implemented. Pollution levels continue to rise in less prosperous inland cities as well, but they appear to be less of priority for the leadership in Beijing.